Now that Payback's been taken care of and we're onto a new story, maybe we can see if Matt McGinnis has what it takes to be the Robin Beyond that we all want him to be......... you know, except for Terry. Let's find out as we jump into this story and see what's going on in Neo Gotham, thirty-five years from now. Let's check it out. As our story begins tensions are high in Gotham and at Wayne Manor, where Terry is still pissed at Bruce for allowing Matt to come to his rescue in the previous issue and things only escalate from there in the form of romance and trust, that culminates when our hero discovers that a Joker has gone and went crazy at Police Headquarters and we finally get to see Matt in his first real go as Robin.......... Not to mention a crazy cliffhanger that makes me pretty interested in what's going on in the world of Batman Beyond. 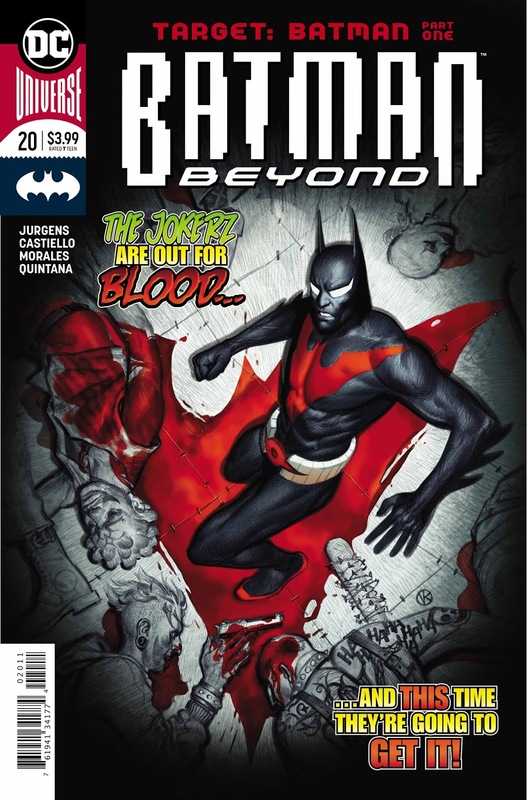 This issue is full of drama in both of Terry McGinnis' identities and introduces a bunch of characters into this series that we haven't seen before and some that have a callback from the animated series. With that and some decent art throughout, this is probably one of the most enjoyable issues of Batman Beyond that we've gotten in awhile because it seems like things are finally moving in some sort of direction and whether that direction is a place that you want to go because of some of the build up of certain characters previously, it's at least interesting and for this title......... that's all I really want at this point. This new arc seems to be on a path that I want to be on with this title because for the first time in a long time, I'm actually into most of the ideas that are being thrown our way. The art is decent throughout and the story actually seems pretty interesting. Hopefully this momentum keeps up because while I've wanted to love this title from the beginning....... It's been pretty rough. Terry dialogue this issue was poorly written, Mat was a little bit to green in terms of situational awareness considering the things he has had to survive. Good ridense Daina, you drag Terry down anyway. 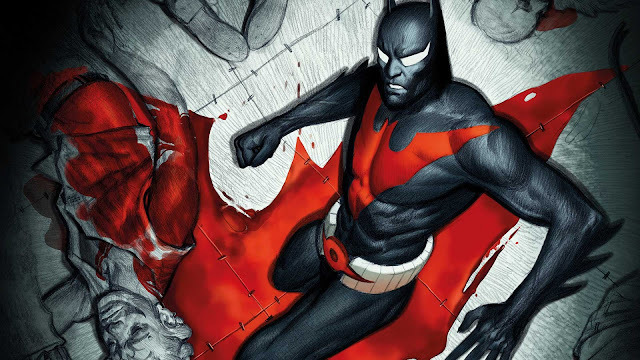 I wish the design of the new Robin costume was a bit more badass like the Batman Beyond costume, but it will do for now I guess. How does Dana drag Terry down? She never interfered with his Batman duties before because he never put her above them before she knew, and after she was the one telling him he needed to go rather than spend time with her. Its her classic Lois lane save me story, with a side of why can't he put me first bull crap. Hero is going to be a hero, and a clear damsel in distress will always be distress. Dana = relationship drama, and I want Terry to finally hero up and be the Batman he used to be in the animated series. Except Dana was rarely the damsel in distress in the series and never at a time that distracted Terry from his Batman duties. The writing for her in the comic is bad, but that's not her fault. 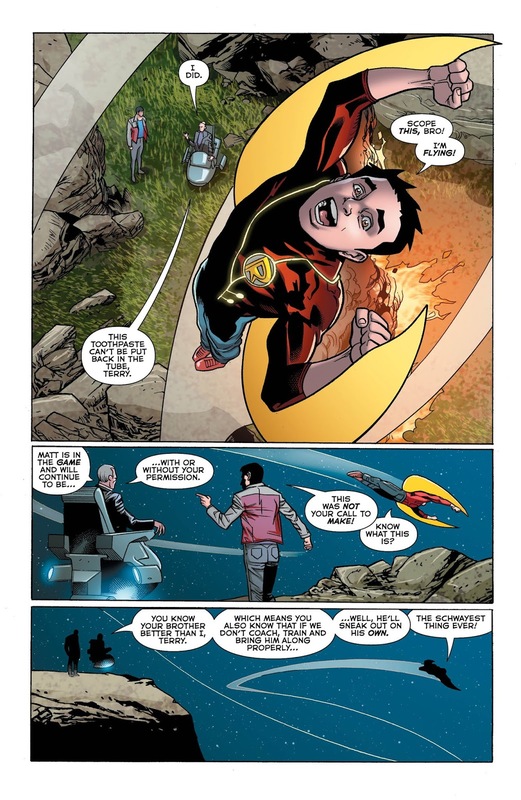 And she's not even the most egregious damsel in distress, even in the latest comic arc; after Terry rescued her in the beginning, he immediately went off to face the villains and held his own, and she got away safely on her own. Contrast Melanie, who got captured minutes after saving Terry, causing him to get himself into even more trouble to save her and need rescuing himself.